Manufacturer of a wide range of products which include quadra chek. 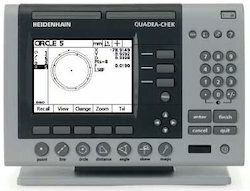 We are actively engaged in manufacturing, exporting and supplying an excellent range of Quadra Chek which are ideal for measuring microscopes, optical comparators and 2-D measuring machines. Our offered chek are precisely-engineered with modern technology that ensures optimum quality and flawless operation. Moreover, our quality examiners stringently examine these chek on predefined quality standards, in order to offer qualitative range at clients' end.